Ouaga residents are used to flash floods and walking in the muck every rainy season. Every year a few mud houses fall down, and water briefly floods areas of town during a downpour. But nothing prepared them for what they were to experience on Sept. 1, 2009. Rain began around 4 A.M in the morning and intensified until it was pouring buckets. It did not stop until early afternoon. At that very moment, Daniel and I were on our way back from Canada after an action packed vacation with family. As we approached Ouaga we began to notice huge rivers dotted with trees, large lakes, and roofs poking out of the water. It was upon arrival that we began to discover the true extent of the damage. Every year reservoirs around Ouaga collect rain water which is then treated to provide the city with water. Canals and gutters have been built to guide the water to their destination. However, there is still much of the city that still needs canals and gutters. Like right behind our house where are gutter ends and the road becomes a river during a rain. Many low income people cannot afford to build cement block houses, so they use mud bricks which are much more vulnerable to rains. Thus, almost 300 mm of rain (over 10 inches) rushed down roads, found its way to canals which overflowed their banks, and ended up in the reservoir which in turn overflowed smashing down cement block walls of property in the vicinity of the resevoir. This included the main hospital of the city which had to evacuate patients to other hospitals, an AOG medical clinic, the denomination headquarters for the Apostolic church, the Department of forestry, one of the most prestigious hotels in Ouaga (Silmande) which also had to evacuate its clients, the electrical plant for Ouaga, one water treatment station, among other govt buildings. Downtown Ouaga, the underground garage of the West African Monetary Union became an underground lake, and irreplaceable archives and documents of numerous other buildings as well as millions of dollars of computer and medical equipment were lost. 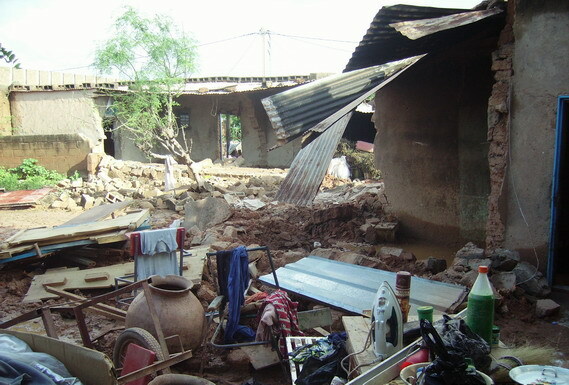 Entire neighbourhoods of mud houses especially on the edges of town were completely wiped out. Those who live along overflowing canals had the fright of their lives as water rose to chin level. Bridges were ruined in our part of town impeding traffic to downtown. Used cars parked along the canal were tossed around like match box toys and piled in disordered array. Those brave fools who thought their cars could go through anything found themselves stranded in the rising water or carried away by the force of the current. Behind our compound, the flow of the water was so constant and forceful that it broke down the wall and rushed through the compound where it broke down another wall on its way out. Fortunately we had an inner wall protecting our private courtyard that kept most of the water from entering our house, but several buildings in our compound were temporarily flooded. Our neighbours with mud houses faired much worse. Around 11 AM on that dreadful day, they came to Daniel's son and asked for refuge in his school, which was promptly granted. As the water rose in their homes, they went out and stood in the water while they saw their houses collapse into the water. Almost 200 official centres of refuge have been set up in in schools around the city, not counting the un official places like our school, and those hosting friends and family in their homes. An estimated 150 000 are homeless, but I would not be surprised if it is more. City and national authorities are overwhelmed trying to take care of their own damage and help the homeless at the same time. The entire population have been called upon to donate clothes, shoes, blankets, mats, food and money during this week. Every bank has opened an account where money can be deposited for flood relief. There were already reports of quarelling taking place because of lack of food in some centres. One of my first activities upon arrival was to clean out my clothes cupboard of any little used clothes and shoes. In walking around our neighbourhood and seeing affected neighbours, I see that their most urgent need is to get a shelter over their heads as soon as possible. But what do you do when most of your little bit of money was washed away with the mud? And there is no way one can re build a mud house in the middle of rainy season. We have another six weeks to go before the rains stop. 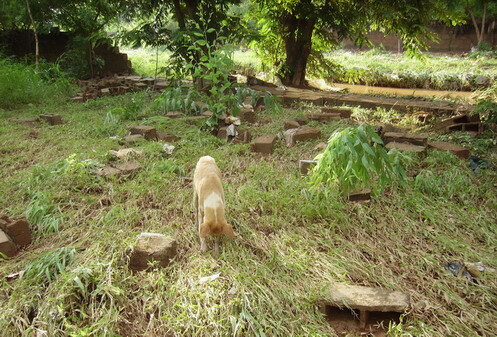 So far Habitat for Humanity does not yet have a representative in Burkina Faso. This would be the perfect time for them to help out! I heard that the UN Relief will be moving in to help the govt coordinate the efforts. You Tube - Search the words - inondation Ouaga - . There are over 20 videos of the event. Your prayers are appreciated as we seek to help in the best way possible according to our resources. Pray also for our country's leaders and all those who are involved in coordinating the relief efforts, and for a rapid resolution to the sanitary conditions in the city, so all can have clean water and safe shelter against the elements, and so that no epidemics break out.